Yellowstone National Park is known for its geysers, but did you know that it is also the site of one of the world’s largest volcanoes? The same geologic activity that causes the multitude of geysers in the park is also responsible for the huge volcano located there. Scientists estimate that it is one of the largest volcanoes in the world, and so far it is the largest volcano in North America. The volcano is 55 km by 72 km in size. Yellowstone’s volcano is in the class of super volcanoes due to its size. There is no exact definition for what qualifies as a super volcano; however, some scientists have defined it as a volcano with an eruption greater than 240 cubic miles. Additionally, the Yellowstone Volcano does not look like the popular image of a volcano. Instead of being a conical mountain, it is a large depression in the ground like a cauldron. This type of volcanic feature is known as a caldera. It is very difficult to see the actual shape because it is covered with trees and has eroded over thousands of years. The cause of the volcano is the hotspot on which Yellowstone is located. At a hotspot, molten mantle rock tends to rise toward the surface causing different geological activity. Volcanic eruptions from the hotspot also helped form the Snake River Plain. Not only do volcanic eruptions occur around the Yellowstone region, but the area also experiences many earthquakes. The region experiences around 1000 to 2000 earthquakes each year, although most of them are usually quite small. Despite the fact that the volcano has not erupted in hundreds of years, it is still active. This is a concern to scientists who have placed sensors around Yellowstone, so the volcano is continually monitored. 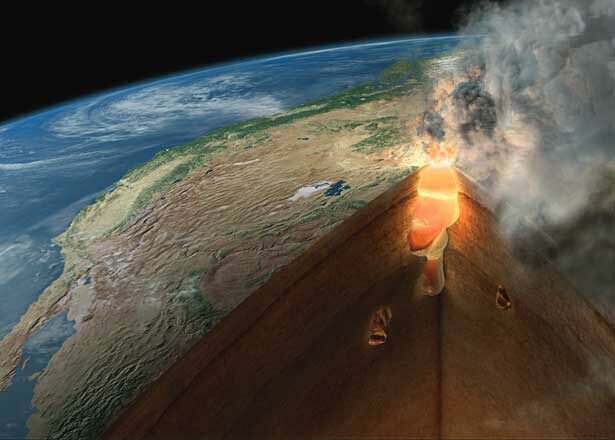 The possible eruption of the Yellowstone Super volcano is of concern because of the enormous destruction it would cause. The last eruption was believed to be approximately 640,000 years ago. The eruption was on such a scale that it made the 1980 Mount St. Helen’s eruption look like nothing and result in damage and destruction many miles around. Scientists estimate that the other two eruptions from the Yellowstone Super volcano came over one and two million years ago. Since the volcano is still active, there is always a possibility it will once again erupt. However, scientists do not anticipate that there will be another eruption in the near future, at least one on such a massive scale. Universe Today has articles on Yellowstone eruption and Yellowstone Super Volcano. For more information, try Yellowstone Volcano and Supervolcano. Astronomy Cast has an episode on volcanoes hot and cold.